Change of the top position is shown with the arrows or a star (new designer, or a designer, who is new in my statistic package). 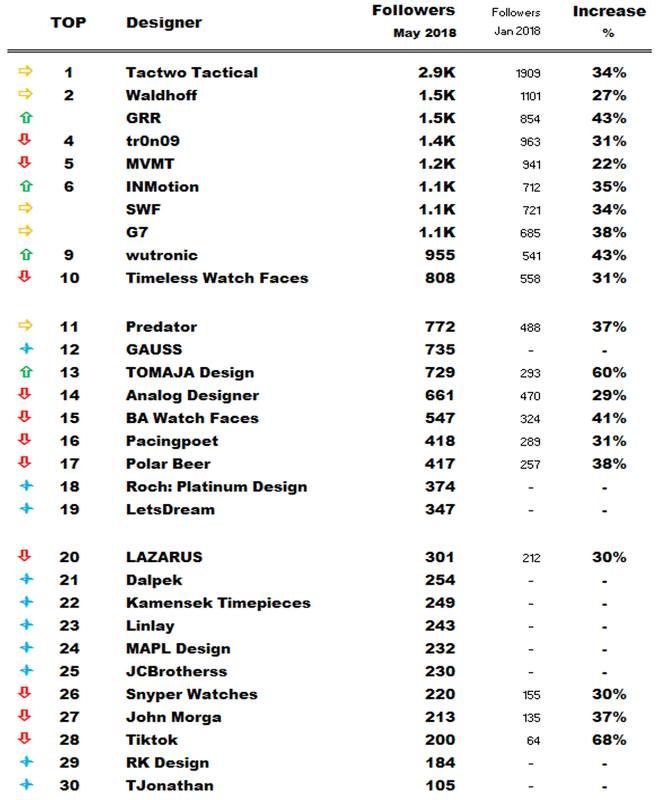 I am sorry for the approximated data of designers with more than 1000 Followers (Tactwo Tactical, Waldhoff, GRR, tr0n09, MVMT, INMotion,SWF,G7). Since May 2018 I could not track the exact number due to a change at Facer designer pages. Please, if you know somebody who actually should be in this list due to followers number, just give me a sign. Is it ranked by the number of followers? With these statistics we are going to have to raise bets, hahaha! Again as in every publication ... excellent work! Hi @Mellin, yes, I do track the followers number and just put it together. However I started with "only" TOP 10 in January 2018. Every month (week) I do add some new designers who are promoted at facer in the hope they. So it grows to TOP 20 and now to TOP 30. The lower the position the higher the chance that I miss some of the designers. Similar to one of my last topics I add new designers to this growing statistic (I just putted in one premium guy with 155 followers and 149 watch faces ) to be more precious. However, it always* stays only a ranking of TOMAJA Statistic Data. PS: You are not so often active here in the community any more... What's your main focus now? Donkey balls, I dropped a spot. Oh well. At least you are moving up @Tomas. 60% increase, nice. @GRR & wutronic are the heros ot the Top 10. Actually I observed a huge drop (app 50%) of new followers per day since I am making paid premium watch faces. Could you guys remember on your "switch" time? Looking back at my data, the rate is fairly steady.